Time once again for me to sound like a madwoman, but there are some topics for which the modest, objective vocabulary of sane discourse is not well suited. This is true particularly of experiences which bring on moments worthy of the phrase “so happy I could die”: the experience of perfect spring weather on the prow of a sailing ship, of standing before Botticelli’s Madonna della Magnificat, of a farewell dinner at a favorite restaurant with six best friends, of having the world’s top expert on your subject praise your article, and of biting into real mozzarella. Some readers will not have tasted real mozzarella yet, but those who have already know what I mean. For those who have sunk our teeth into the velvet, meaty milk-flesh of a real mozzarella, which bleeds whey as it explodes with flavor-hypersaturated salt-cream, it is as difficult to believe it is the same chemical substance as string cheese or Domino’s pizza as it is to wrap one’s mind around the fact that dribbling, drowning water is in fact two-thirds breathable oxygen. It’s not similar. It’s not the same food, not even in the same mental category, like roast pheasant and turkey sandwich slices, or matzah and a baguette. A true mozzarella is milk white, often in ball form, and best preserved submerged in brine. It is soft, resilient, very slightly spongy, and usually salty, though some are made with little-to-no salt when intended to absorb surrounding flavors, as in a salad or a filling. 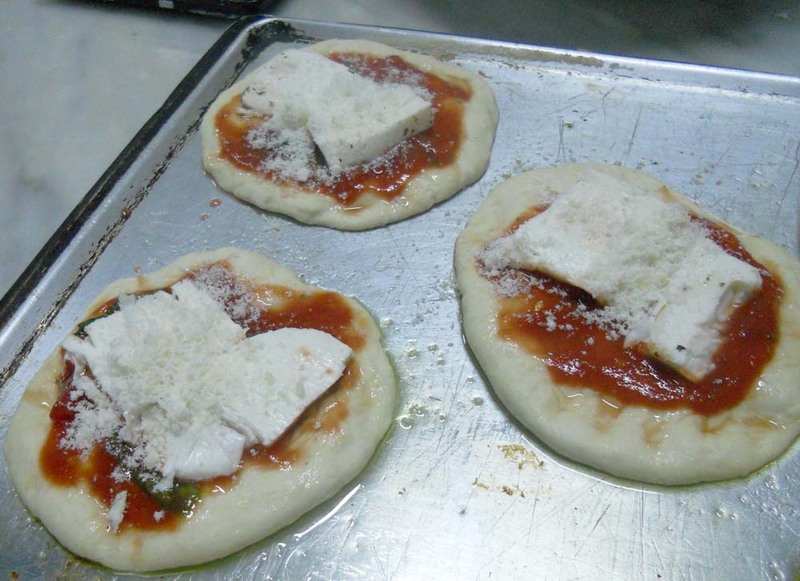 A large ball will have a skin layer of a distinct texture, which is not a separate substance wrapped around the mozzarella, but the result of a chemical change caused by the surrounding liquid leaking in. Fresh real mozzarella is softer and wetter than the "low moisture" mozzarella used for American pizza, so it creates a wetter, jucier result (sometimes even soggy) but also doesn't need to be shredded and distributed evenly the way dry mozzarella does. My personal theory about why good mozzarella gives the brain such a direct blast of pleasure-center positive reinforcement is that it so richly combines the taste experiences of infancy, specifically nursing and weaning. The pleasure center of the brain is programmed to fire off as positive reinforcement when a baby takes certain actions necessary for life, of which the first is nursing. Fatty, sweet, salty milk liquid is thus a primordial addiction, and mozzarella with its never-chilled sweet-fat-salt is arguably more similar to breast milk than skimmed, refrigerated cow’s milk is. When weaning approaches the pleasure center fires off anew to teach us that chewing and swallowing and solids are also good, and mozzarella’s soft, fleshy texture thus feeds that general solid food addiction too. This is all pure hypothesis, but there is a staggering power to the experience of real mozzarella, not quite like any other food in the raw burst of “Yes!” that shoots through the psyche. So delightful is a good, true buffalo mozzarella that I have known certain people at schools or institutes to tell the kitchen that they’re vegetarians just because the vegetarian alternative is occasionally mozzarella, and the heaven of mozzarella once or twice a month is worth giving up meat the rest of the time. Let’s clear some terminology. Buffalo mozzarella, or mozzarella di bufala means mozzarella cheese made from buffalo milk. 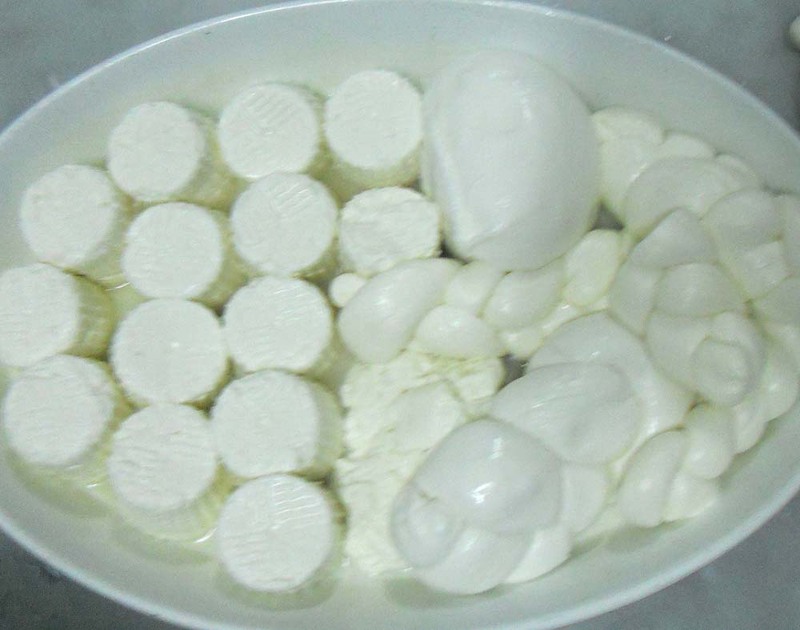 In Italy, mozzarella made from cow’s milk is called fior di latte. Mozzarella di Campana means it is made from milk from the region of Campana in southern Italy, which is supposed to have the best milk, and where, legend has it, farmers offer miraculous roadside mozzarella stands, just as those in New England offer apples or summer fruit. Buffalo milk is fattier than cow’s milk, making a richer (and even more luxuriantly calorific) cheese. Fior di latte is also a gelato flavor, and is completely unflavored pure sweet milk. 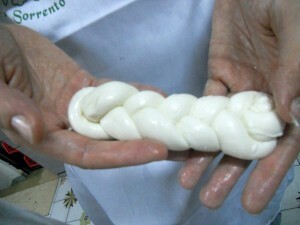 Sometimes mozzarella is braided like this, which makes it firmer and stringier, with less soft middle - not my preference. Once only in my life I have had genuine farm fresh mozzarella, made when I ordered it, at the farm with the buffalo right there, and it was so delicate that when I touched it it bled milk. That experience may not e repeatable outside a few corners of agricultural paradise which even in Italy I rarely have the opportunity to visit, but that does not prevent me from tearing up when I bite into a good grocery store version. Yet a “good grocery store version” is not easy to come by in many regions of the unhappy Earth. Even at upscale grocery stores which in the US now often offer fancy mozzarella, alluring in its brine-bath, the odds are, in my experience, one in three at best that the cheese within will turn out to manifest mozzarella’s true majesty. 1/3 of the time it will turn out to be practically unsalted bland mush, and another third it will be only a pale shadow. It is worth trying, but at $5+ a ball at most yuppie-marts it can be a frustrating gamble, since the fail condition is pretty-much overpriced playdough. Yet there is hope! This particular elegy to the Boddhisatva of cheeses was spurred on by this article on how to rehabilitate lame store-bought mozzarella too make it taste like real mozzarella. Two-sentence summary: when mozzarella is refrigerated it undergoes a chemical change which makes it retain more moisture, making it become bland and dry in contrast with unrefrigerated mozzarella, and giving it a solidity which melts to create the stringy texture associated with American pizza. 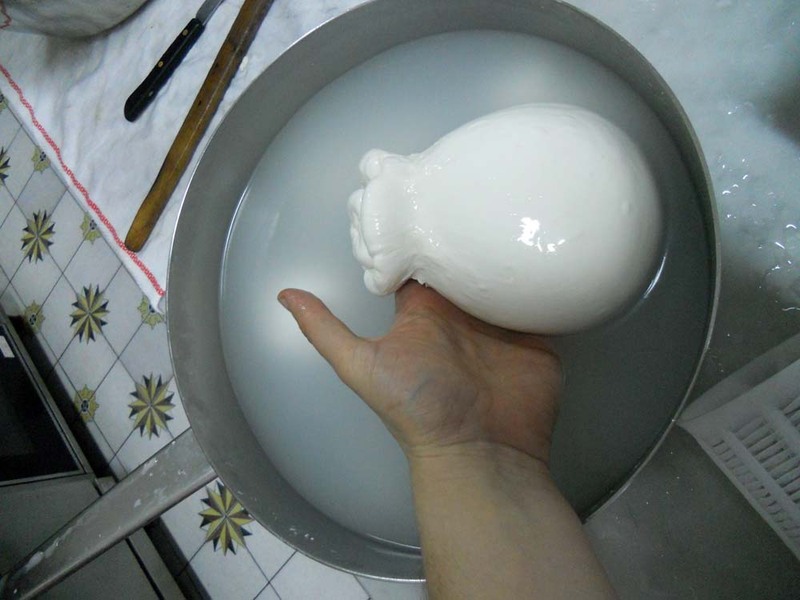 Empirical study shows that can overcome and partially reverse this chemical process by soaking the mozzarella in salted warm milk for an hour or two (circa 110 degrees Fahrenheit, 43 Celsius). I have yet to try the experiment myself, but if it proves true, it may be one of the greatest technological advances since butter. Sometimes mozzarella is made into a bulb with a vase-like neck like this. This is intended to be tied with a cord and hung up to dry, or to be smoked. And then there is Burrata. 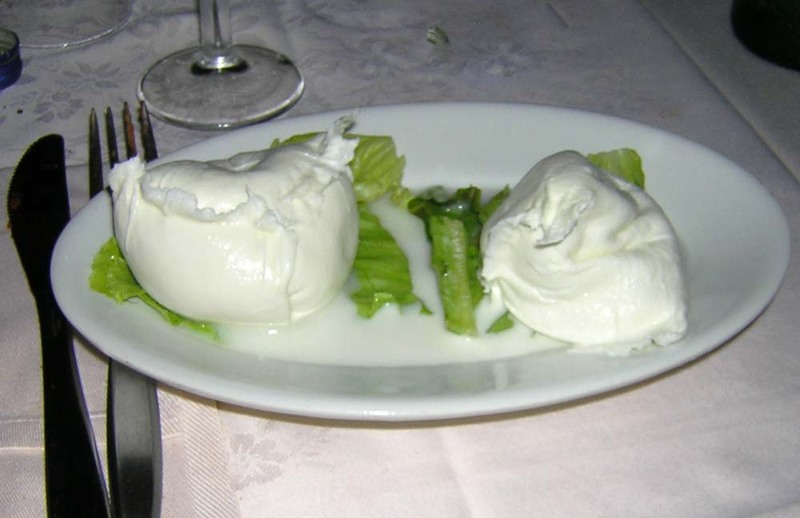 Last year I sent a friend off to Italy with instructions to eat at my favorite Roman restaurant Cul de Sac, and there to order, from their vast cheese menu, the Burrata. Seeing him again months later I asked if he had done so. “Yes,” he answered with maniacal glee. “Three times.” Burratta is the more luxuriant cousin of good mozzarella, made by wrapping a shell of mozzarella around a belly-ball made partly from mozzarella and partly from raw cream. BEWARE: I have encountered “Burrata” in American grocery stores, notably at the Whole Foods flagship store in Houston, but an old burrata easily becomes bitter, a nasty awakening from hope for those who have tasted the sweet cream original. Some burrata are so packed with cream that they are really half cheese, half butter, and at farmer’s markets they are sold wrapped up in leaves. One New Years’, I brought such a burrata with me on the overnight train from Florence to Paris where I served honeymooning friends breakfast in bed with a hot Parisian baguette to spread the cheesy-butter on. None of us would undo the experience given a second chance, but I know all three of us look back on the feast with some small sense of mourning that we allowed ourselves to become irredeemably addicted to an experience which can only be achieved by crossing the border from Italy to France before non-refrigeratable cheese goes off. Another good way to find real mozzarella is at a good restaurant. Caprese salad, a dish made by alternating slices of mozzarella and tomato, sometimes drizzled with olive oil, is always a gamble since at a good place it will be divine and at a bad place super lame. But it is good enough to justify the gamble, if you watch for the right signs. The major bad sign is if the restaurant has caprese sitting around on display, either in a case in the front, or under plastic wrap. Such caprese were cut ages ago, whereas a good one has to be cut immediately before being served, or else the soft mozzarella collapses. As for good signs, really the best you can say is that a good place will serve a good caprese. The best sign is if mozzarella is an option by itself, or if a place has a cheese menu. 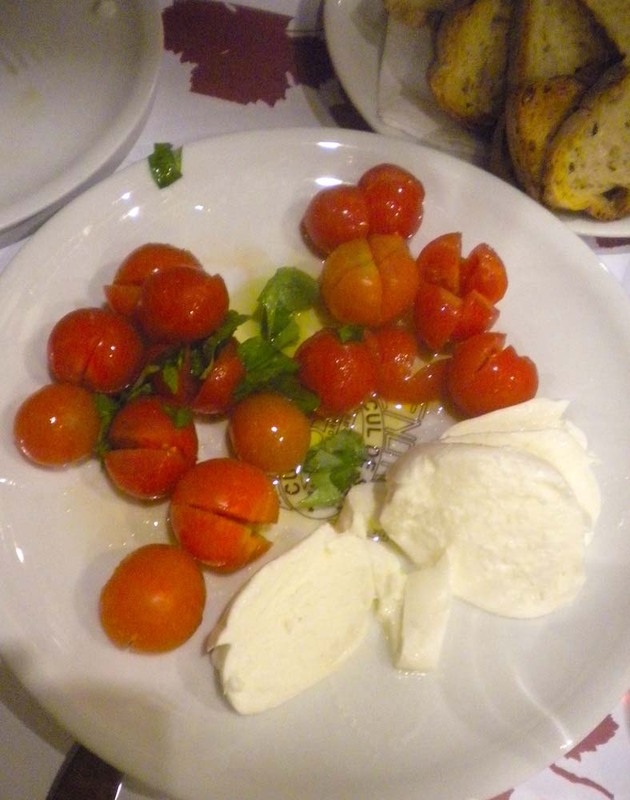 Generally a restaurant will not offer a mozzarella, or a burrata, or any cheese, by itself unless it’s good, since without the tomato to help cover it it’s embarrassingly obvious when they’re using bad supplies, and Italian customers would not stand for it. Thus, if it’s alone, you can usually trust it – if it’s in a caprese, it could go either way. Tagged with: cheese, cooking, mozzarella, S.P.Q.F. A simple breakfast from the corner store. I didn’t have time to go to a restaurant for lunch, or to make it to the good market, so I had to make do with what I could grab from the little corner store at the end of my block. Still, not too shabby. Good Mozzarella di Bufala, tomatoes, basil, a sweet Prosciutto Toscano, young first crop figs, redcurrants, young Pienza (the official cheese of Pope Pius II), a tall glass of milk, fresh blood orange juice, and salad with Greek feta and Italian oil and vinegar. (As you read I’ll give you three guesses and a few paragraphs to figure out which of these things was the hardest to find). While everyone expects to be wowed by the restaurants in Italy, the grocery stores are just as overwhelming, and many of my most memorable Italian meals have been at home. Grab a few fresh veggies and fry them in olive oil, serve over pasta. But even cooking things is often unnecessary. Italian cuisine is about ingredients: good vegetables, good cheese, good meat that you can just eat, no need for preparation, eat. In Venice, where all but a golden handful of restaurants are tourist traps, I usually just go into a grocery store and buy a quarter kilo of whatever cheese is freshest and sit by the canal and eat it (and offer it to any sad-looking anglophone strangers who wander by, and are inevitably delighted). The cold cuts too are a centerpiece instead of a substitute for real food. Most countries never have and never will consider cold cuts a main dish, but if you get really good ones they don’t need to be disguised with a sandwich and its toppings, they are, by themselves, perfect. Real prosciutto literally melts on your tongue like butter and fills your mouth with the soft sweet salt of paper thin meat – more flavor from one ounce than from an entire pack of common store “salami”. It’s actually slightly unsettling how much better the ingredients are. Figs and oil one expects to be better here since here is where they come from, and redcurrants and Pienza cheese (a soft, chewy cheese with the texture of colby or jack, but with a mild Romano-esque tinge, gentle and filling; completely different in its aged state which is so strong down the Romano spectrum as to be almost spicy) you can’t find in most corner stores, but it’s the simpler things that are slightly alarming. Milk, for example. Keep in mind here that I’m a serious milk drinker. I don’t just like milk, I actually systematically explore milk, comparing different brands, farms, percent mixes. I’m not a 1% person or a skim person or a whole milk person, since I like all of them, each for its unique qualities, the creamy instant-full-feeling of whole. I can therefore say with some confidence that milk here is better. It just flat out tastes better than milk in America. The common, cheapest of the cheap store brand milk tastes as good as the fancy expensive organic stuff in the US. In fact it tastes as good as the extremely expensive un-homogenized stuff, except for not having the lumps of half-formed butter peppering it as it glides down. Why? The only answer I can come to is production without hormones. I’m not saying this out of any environmentalist agenda, just as a neutral observation from someone who’s tasted a lot of milk. Italian tomatoes being superior is one thing–they get better sun here, better soil, the tickle of the Mediterranean in the air–but cows are not photosynthetic. EU restrictions on artificial hormones is the only real difference I can think of. That and the fact that Italians care about ingredients. In fact, the whole cuisine is about ingredients. No one can win an argument about which is the best cuisine in the world, and I won’t argue that even the finest (non-truffle) pasta dish is usually not a match for a proper French or Turkish pastry or a really good tuna nigiri, but I think I’m right in saying that Italian is the best simple cuisine in the world. The most delicious pasta sauces are usually still just a few ingredients prepared in a very simple way. My Amatriciana and Carbonara I can make in the time between when the pasta goes in the water and when it’s soft enough to eat. Because so little is done to the ingredients, their quality really shows through. This is likely why it developed in Italy, where the vegetables and other food are naturally so good, so doing almost nothing to them is best. Elaborate kitchen alchemy is necessary only when the fundamental foods are, well, the sorts of things subsistence cultures had to eat. French baking is an art form, as are German sausages, all kinds of curry, but when what you have are truly good ingredients, Italian is definitely the best way to bring them out. That also makes it the easiest great cuisine to become proficient in. Anyone who wants to achieve a fine French sauce, or even cook a really, really good steak, requires a decent apprenticeship. Good Italian? One session in the kitchen with me and you can wow friends and neighbors, and I didn’t have much more than that with the Italian Moms (and American professors) who taught me. 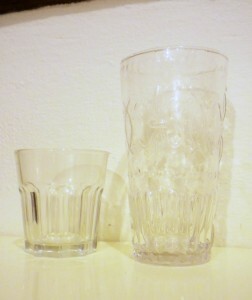 A standard Italian glass beside my own. Have you had your three guesses yet? That’s right! The most difficult thing to find was: a tall glass of milk. Specifically a tall glass, as for reasons passing my understanding the standard sized drinking glass in Italy holds about three mouthfuls of liquid if that. I had a grand hunt up and down the shopping district hunting for a glass large enough for what I never realized was apparently a rare perversion: taking a deep breath and downing a huge, cool glass of water, or taking a large volume of something with you to accent a meal. Between that and the fact that water is so scarce and expensive in restaurants, and wine so common, I remain among those baffled that the Italians don’t all die of dehydration. In Rome where public fountains provide free water everywhere it’s one thing, but in Florence where said fountains are scarce and, when present, inevitably broken? Must be the patron saints. Or… who would be the Roman god of hydration. Neptune, maybe? Apollo? Castor and Pollux perhaps? Leucothea? 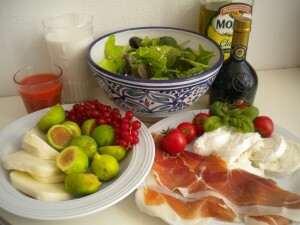 Tagged with: cheese, Italian food, mozzarella, prosciutto, S.P.Q.F.